a superficial muscle of the forearm, arising from a humeral and an ulnar head and ending in a flat tendon that inserts into the radius. It functions to pronate the hand. Compare flexor carpi radialis, flexor carpi ulnaris, flexor digitorum superficialis, palmaris longus. 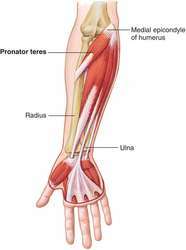 Similar tenderness was found on the lateral forearm extensors, common extensor tendon, and pronator teres muscle. What's more, power assessment of the pronator teres, flexor carpi radialis, and flexor digitorum superficialis may exacerbate symptoms. The most common site of pathology is the interface between the pronator teres and the flexor carpi radialis origin. Variations in its number of branches to pronator teres are frequently seen. It curves distally and forwards, its apex being connected to the medial border, proximal to the epicondyle, by a fibrous band, to which part of pronator teres is attached. Abduktor pollisis brevis ve pronator teres kaslarinin igne EMG'sinde kronik norojenik MUP degisiklikleri izlenmis olup spontan aktivite izlenmedi. Compression can occur between the two heads of the pronator teres muscle, between pronator teres and the flexor digitorum sublimus muscles and from an aponeurotic band of fibrous tissue extending from the biceps tendon to the forearm fascia. On further exploration, the muscle was found to extend from the proximal insertion of pronator teres in a longitudinal direction towards the wrist, passing within a separate tendon sheath deep to Fiton's canal. The highest amount of muscle activity was observed in the pronator teres (X=28. At the proximal origin, it fuses with the remnant of the pronator teres muscle, which is attached to the medial collateral ligament of the elbow joint.